Rev. Phil M. Turner was born in Memphis, Tennessee. He received Christ and was baptized at the age of nine at Mount Nebo Baptist Church, Memphis Tennessee. At the age of ten, he and his family moved to Buffalo N.Y. where they became active members of Holy Temple Church of God In Christ. During his time as a student at State University of New York at Cortland, Pastor Turner met and married Janice Flanagan. Their union has blessed them with three children and four grandchildren. Pastor Turner has had extensive experience in sales, marketing, counseling, and administration in large corporations and small businesses. He has held recording contracts with Warner Brothers and Fourth & Broadway, a division of Island Records. He feels that the greatest resources for relevant and effective ministry are Gods Word, Spiritual gifts and life experience. 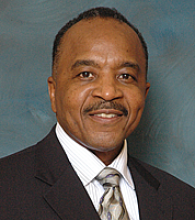 Pastor Turner became a member of Bethany Baptist Church in March of 1992 and served in various ministries, such as, Chairperson of the Men’s Fellowship and Minister of Music. Pastor Turner also served as Assistant to the Pastor and as a member of Bethany’s Clergy Team. Reverend Turner holds a Bachelor of Science in History and Political Science from Columbia College and a Masters Degree in Theological Studies from Northeastern Seminary in Rochester, New York. The church should minister to the whole person, guiding them to be fruitful in family, work, health and as contributing members of society. The church is accountable to God to be a light in its community, provide spiritual enrichment for sustaining life to the Glory of God.